October 13, 2018 – 10 AM to 3 PM – at the University of Manitoba! We are Away Until We Hit The Dance Floor! 5 hour dance relay supporting kids and adults with disabilities! DJ and lots of dance music! Dance Instructors and follow-along demos. Check out our bios here! What would you buy at the Jets Store with $250 in your pocket? Collect pledges to win one of two $250 Jets Store Gift Cards! Earn one ballot to win for every $100 in pledges you collect by October 10, 2018. For example, $2,000 in pledges gives you 20 chances to win! There are two prizes. First winner drawn is not eligible to win again. Cash/cheque must be recorded on downloadable pledge form and delivered to the Movement Centre for accounting by October 10 at Noon. You can collaborate with up to 18 co-workers or friends to make a team of dancers. If you are a corporate team, we want you to encourage your company/organization to match what you raise. Register today by clicking “Register or Sign In”. Once registered, it’s easy to ask friends and family to pledge your team online through your fundraising page. Tax receipts are automatically emailed after a pledge is made online. Printable pledge forms are available HERE, or contact The Movement Centre of Manitoba at info@movementcentre.ca or by phone at 204-489-2679. Set Your Team Fundraising Goal – To ensure the event’s success, a $500 minimum in funds raised is required by each team to participate. What If I Can’t Get a Team Together? May I Still Participate? Not able to put a full team together? No worries! “Solos” are welcome – so register, fundraise and come out to dance with us at our event! What If I Want to Make it a Family Event With My Children? That would be great! Why not get a few families together to form a team. Participants under the age of 18 are encouraged to take part as well! Some teams participate in the optional dance relay part of the event. Here are rules for this contest to see which team can dance continuously for the entire 5 hours. Teams are provided with one sash that is shared among their dancers. One dancer from your team – wearing the sash bearing your team name – must be on the dance floor at all times between 10 am and 3 pm. The sash is shared among team members as they trade off on the dance floor. The dancer wearing the sash must stay within the boundary outlined by tape. If the sash leaves the dance floor, your team will be disqualified. Sashes of disqualified teams will be collected by the Dance Police. The team(s) still dancing at 3 pm will declared the winner(s). Want to be a part of this great event as a volunteer? Contact barbrodick@mymts.net to sign up! University of Manitoba: The Move ‘N Groove-a-Thon will take place in the multipurpose room located on the second floor of University Centre at the U of M.
Due to the 1pm Bomber Game, parking on campus will NOT be free (unlike most Saturdays) and will be restricted. 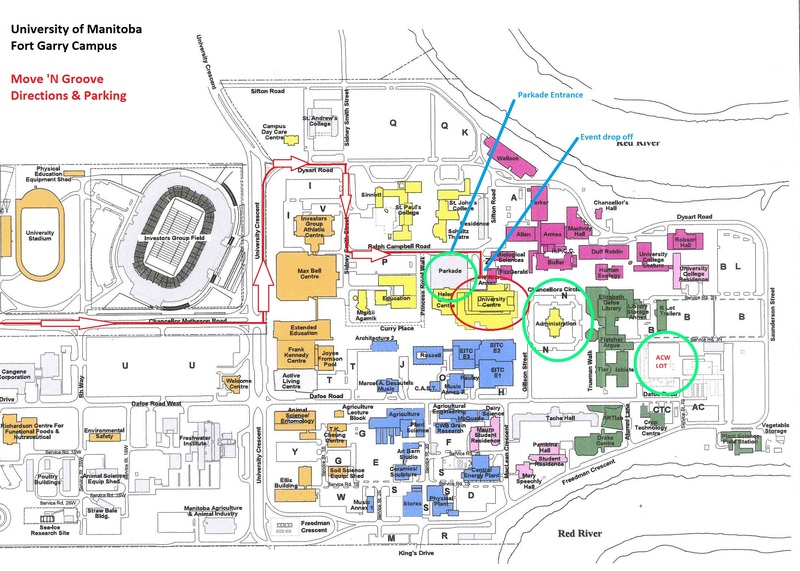 For participants requiring accessible parking – handicap parking is available in the parkade and will be blocked off. Take a ticket upon entering and you will receive a parking voucher at registration for a no cost exit. Follow signage for parking and drop off. Volunteer parking patrols will be on duty to help with parking. Stay up to date and share the dance fever on our Facebook page!